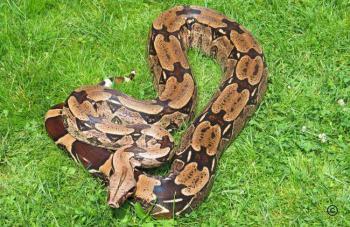 Brazilian red-tailed boas are hardly ever found in captive collections. This is mainly due to the fact that the Brazilian government prohibited any export of protected animals (apart from very rare exceptional cases) in the early 1980s. Even the private husbandry of boas has been illegal until quite recently. Then and now, however, Boa constrictors left the country in tourists’ suitcases. 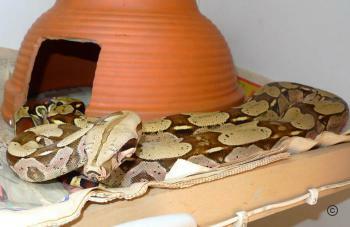 In 1984, a Bavarian tourist imported to Germany several baby Boa c. constrictor he had purchased in a market at Belém. In 1990, he succeeded in having these animals breed. The result was a rather small litter comprising ten baby boas. In 1992, a second breeding success was had before the ‘imported’ parent animals passed away. In 1996, the first young produced by the F1 generation of 1990 were born. Although US breeders keep more Brazilian red-tailed boas than their European colleagues, the number of theses snakes, compared to that of animals from Suriname and the Guyana states, is almost negligible. If one considers the number of snakes kept in our terrariums in relation to the extension of their distribution area, it soon becomes evident that the color and pattern variations of the Brazilian Boa c. constrictor are almost unknown. With some rare exceptions, all South American countries have a common border with Brazil. In most cases, these boundaries are just lines drawn by some politician and do not constitute natural barriers which might impede the expansion of Boa constrictors and other animals living in the respective border regions. As a consequence, the Brazilian red-tailed boas occurring near the border with Suriname visually differ from those we find in regions which border Peru. The same applies to the animals living in areas adjacent to Colombia, etc. More or less well-defined black patterns (which may be reduced to black speckles) in the pale regions between the saddle patches are apparently a typical characteristic of the Brazilian Boa c. constrictor inhabiting the regions closer to the center of the country. 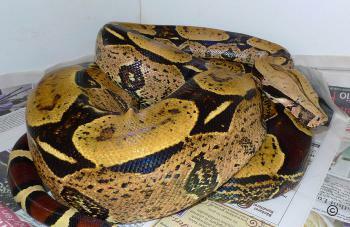 Mainly two variants of Brazilian Boa c. constrictor are found in captive husbandry in Europe and the U.S. The most beautiful and most desired ones are the animals from the north-eastern part of Brazil on the Atlantic coast. In this region the Brazilian redtails show an ebony or ochre dominant color and sometimes an aberrant saddle pattern. 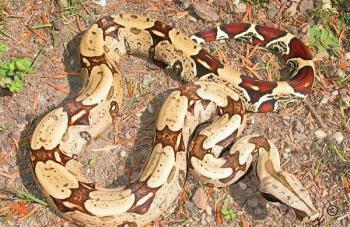 The boas from this region have established the reputation of the Brazilian Boa c. constrictor as beauties, second to none. Thanks to the Bavarian tourist mentioned before who has purchased the first of these specimens in a market in Belém the denotation "Belem boas" for this variant has gained acceptance. 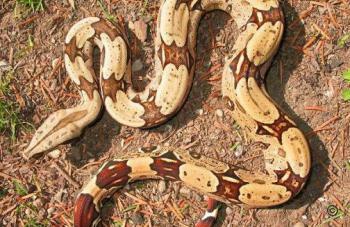 It is safe to assume that the natural habitat of these boas was somewhere in the state of Pará/Brazil. This conclusion is supported by the fact that a strain of Brazilian boa c. constrictor in captive care which is known to be from the region of Ilha de Marajó must without doubt be designated as "Belém Boas" according to their appearence. 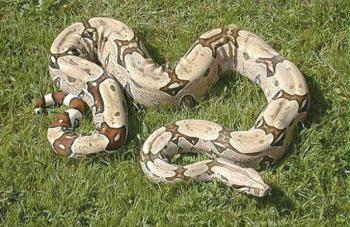 Only a few breeders in Europe has ever bred the Belém variant of Brazilian Boa c. constrictor. The only breeder in the U.S. was Gus Rentfro, who has quit keeping boas in 2013. 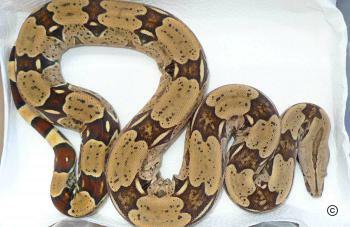 The second variant of the Brazilian Boa c. constrictor available in captive husbandry are the "North Brazilian redtails". Their distribution area is the region near the border to Suriname and the Guyanas. They can be distinguished from their northern relatives mainly by their lack of color in the flanks. However, this statement is made under reserve because it would be questionable to make a safe conclusion about the appearance of an entire population based only on a few dozen captive kept specimens.